The Russell Falls Cottages offer self-contained, self-catering accommodation suitable for couples and families. They are located in the Mount Field National Park area of South West Tasmania, a short drive from Hobart. Guests have access to wide range of Tasmanian wilderness experiences, suitable for all ages and fitness levels. The Russell Falls have continually attracted visitors since the Falls became Tasmania’s first nature reserve in 1885. Perhaps the most photographed waterfall in Tasmania, its three elegant tiers are framed by lush temperature rainforest vegetation of swamp gum and sassafras. The Falls are only a short easy-grade walk from the Cottages, along a paved walking trail. Mount Field was declared a national park in 1916, and is known for its remarkable ecological diversity. The Park is also distinguished by its wide range of popular short, medium and longer walks of varying grades. There are walks suited to all ages and fitness levels, ranging from easy low-level strolls to serious adventure treks. There are two main sections to the Park. Closest to the Cottages is the Russell Falls area, with the Park Visitor Centre and Cafe and the Charles Marriott Shelter (BBQ facilities and children’s playground). Most of Tasmania’s land mammals are present in the Park, and there’s a good chance you will see smalls marsupial on one of the walking tracks near the Visitor Centre or the Falls. The second section of the Park is the extraordinarily beautiful alpine area of the Lake Dobson and the Tarn Shelf. This is located only 16 kilometres from the Cottages along an easily accessible winding gravel road. The grove of tall, palm-like pandani on the shores of the Lake has a Tolkein charm, while higher up, the Tarn Shelf takes you to the edge of precipices overlooking glimmering pools on the rim of the mountain and expansive lakes in the valley below. In Autumn, the slopes of the mountain that backs onto the Tarn Shelf are ablaze with the gold, red and orange foliage of Australia’s only deciduous tree, the endemic beech (Nothofagus gunnii), or the Fagus tree as it is best-known. You can learn more about the history and ecology of the park at the Visitor Centre near the entrance, where you can also get information on the many walks. In summer, park rangers present activities and talks of interest to visitors of all ages. The Tyenna River is located at the bottom of the Cottages’ garden. This pristine mountain river enjoys a reputation as one of Tasmania’s (and the world’s) premier trout fishing rivers, renowned for its large head of fish, consistent flows, beautiful surroundings, and challenging angling. The trout population is dominated by browns with a sprinkling of rainbows, and there is even the occasional Atlantic salmon. Fishing licenses can be purchased at the Bushy Park Roadhouse, situated a few minutes drive from Westerway. The Big Tree Reserve was established to protect some of the giant trees found in the Styx Valley. The tallest flowing plants on earth, some of these Eucalyptus regnans are over 85 metres tall. A boardwalk with interpretive information provides a quick circuit through the area. 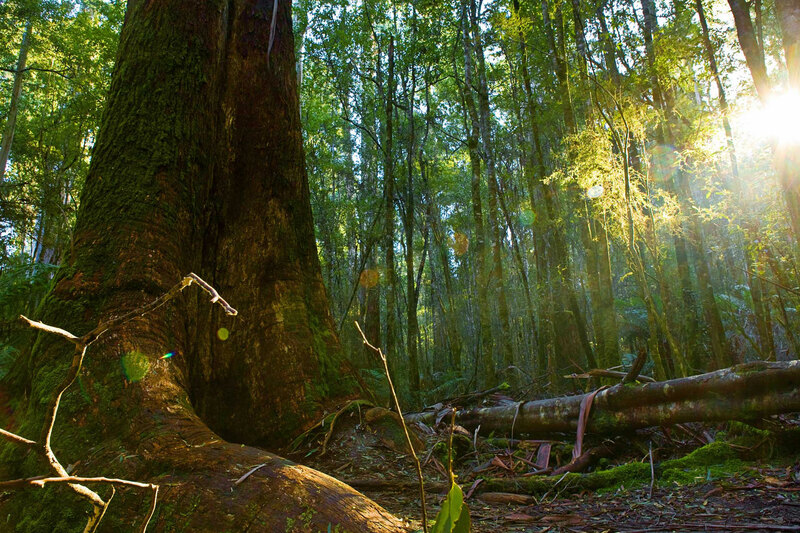 In 2005, the Reserve was expanded to include the Tolkein Track, which winds through a stunning piece of old growth forest once threatened by logging. Situated just outside the nearby township of Maydena is the Junee Cave State Reserve. A short nature trail leads to the entrance of Junee Cave, which is accessible to the general public. Interpretive signs describe the Junee caves, which is not only Australia’s longest cave (karst) system, but also includes Australia’s deepest cave, Niggly Cave (375 metres). Running beneath the snow-capped Tyenna Peak, the Junee karst system contains some of the most challenging caving in Australia, and is a Mecca for experienced speleologists. Turn right at the Maydena store and follow the signs, for five kilometres, to Junee Cave. For further information contact the Senior Ranger, Mt Field National Park, Tel. 03 6288 1149.